Colors! Delicious aren’t they? Here at Building Beautiful Souls we can never get enough – especially of the Gypsy Boho palette! In fact, seconds of all kinds are always on our menu! Colors speak so deeply to our souls that we are convinced Colors have much the same energy as does a Spirit, Totem or Power Animal. But why? What do colors mean? 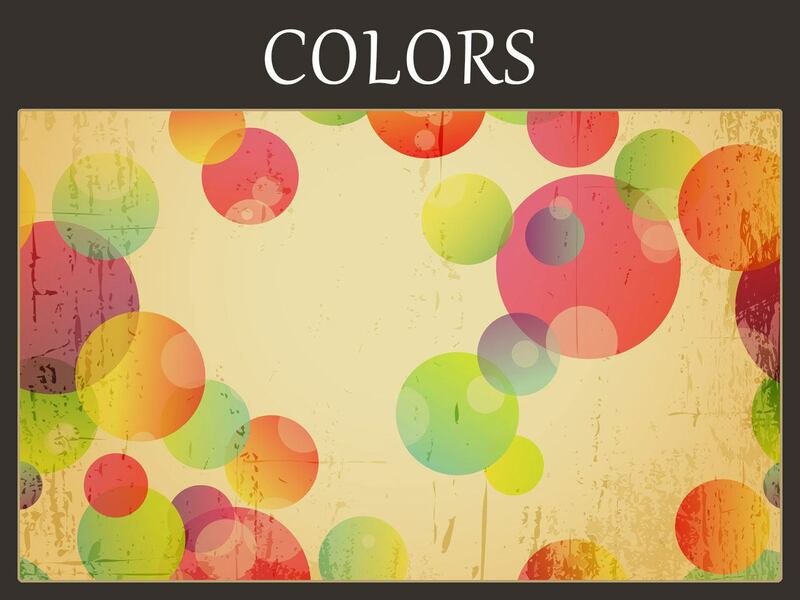 What do colors symbolize? In nature, for example, people think of yellow as warm and welcoming like the sun. It’s a color with a higher energy output than say blue, which is calming. It is important to note that every culture has variances in terms of color symbolism. What we are providing here is a primer that will grow with along with our site. Additionally we encourage you to meditate on what a specific hue means to you. While one person may consider red a power color, another person who got hit in the head with an apple may have a completely different interpretation (namely, watch where you walk!). As you read through the Color meanings here, please know that as with nearly every other emblem known to civilization, each Color can have positive and negative connotations. In some regions white is the color of death. In others it represents purity. None of these values are right or wrong – each person or group brings a little subjectivity to interpreting signs and omens including the colors of the rainbow. The deduction a person makes could have political overtones, religious significance and even meanings that come out of current vogue, so don’t be surprised if you can’t quite put color psychology, meaning or symbolism into a tidy package. Click to read the in-depth article “What Does The Color Red Mean.” or read the short version below. It’s not surprising that the Base Chakra swirls with that powerful, energetic hue that ties to life itself. Red represents the primal self, power, zeal, bravery and our sexual urges. Besides black and white, red is the most common and popular color in the world. In many cultures, particularly the Far East, red represents good fortune. In this region wearing red items at a wedding brings joy to the couple and blessings to the marriage. Balancing that, some philosophies and religions tie the color red to destruction and the powers of evil. 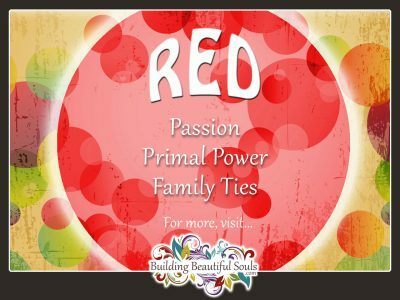 Psychologically speaking red denotes very powerful feelings including love, anger and exhilaration. This is seen in our language patterns such as calling a pan re-hot, declaring red letter days, seeing red or being red blooded. Red has other effects on our perspectives too. Experts tell us that red encourages appetite not simply for food but for many other sensual experiences. Those who have too much red in their environment, particularly children, may find themselves very stressed, discontent and even angry with no particular cause. In Western metaphysical traditions Red represents the Southern Quarter of Creation and the suit of Wands in the Tarot. Magically it’s used in various workings for passion, strength, bravery, inventiveness, and banishing. Remember that the shade of red you choose changes the vibrational impact. Where deep red speaks of committed love and passion, pink has stronger connections with friendship and gentle intentions and copper red has ties to earthy energies for grounding any excess fire. Click to read the in-depth article “What Does The Color Orange Mean.” or read the short version below. The overall vote on the meaning and symbolism of the color orange seems to be split. Some people feel the hue represents vitality, freshness and appeal. Others find it obtuse and irritating to the aura. While we come by the name for this hue thanks to a fruit, there are numerous objects in nature that bear the color orange from vibrant orange lilies to succulent orange carrots (and that doesn’t begin to touch on man-made orange items). In general symbolism, orange brings happiness and health into our lives. It’s also one of the colors of the harvest, representing Earth’s bounty. Light workers sometimes use orange as a way to improve sexual performance and support the immune system. It’s considered an excellent hue for those with digestive trouble. Energetically this color combines red and yellow, which cooperate marvelously together for improved perspectives, inventiveness and diligence. When you like the overall impact of red but need to bring it down a notch, orange is a great option particularly for inspiring mental clarity and resoluteness. Where red was an active color orange is far more intuitive, relying on personal predisposition. In this, when you feel blue orange becomes a heartening helpmate that reminds you of your true self. On the color wheel it hits your “reset” button particularly when grieving, struggling with finances or just need a little confidence to get yourself motivated again. Use highlights of orange in any social setting. This stimulates conversation – both talking and active listening. Like red, this hue facilitates a good appetite but not quite so ravenous. Orange (saffron) is sacred in Hinduism. It is the Fifth Ray of 7 that classifies humans mystically. 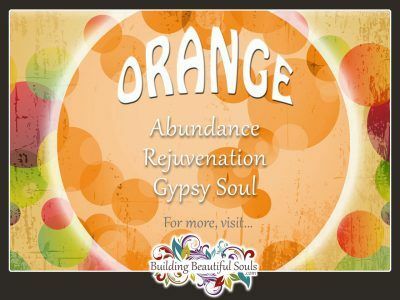 Metaphysically use orange in spells and rituals for personal confidence and liberation. Click to read the in-depth article “What Does The Color Yellow Mean.” or read the short version below. Yellow is the cheer leader of the color wheel! It naturally makes us feel happier and more energized! In an odd dichotomy, it is also the color of caution and cowardice. The negative energies may have had ties to certain medical conditions like jaundice that causes a person’s skin to turn an unhealthy yellow hue. Nearly all cultures tie this color to a sense of warmth, both physical and emotional. In Japan it represents bravery. Many religious groups, particularly those from Ancient Egypt and in Hindu tradition align the color yellow with the Divine. Consider that the halos of angels typically appear in a yellow or gold color. Physically yellow is the easiest color for our eyes to see, which is why it’s used in stop signs. Some students of color therapy recommend yellow to facilitate a sluggish metabolism, improve mental agility especially for finding practical solutions and for developing personal confidence because it vibrates on the same level as the left side of the brain. People who resonate with yellow often work in communication fields. Alternatively you may find yourself drawn to investigative studies. While this sounds very serious, yellow balances out the decisive nature with old-fashioned humor. 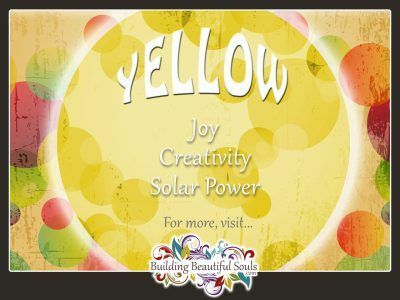 Aligned with the Sun and Mars, yellow is a good color for attracting money. When people go through times of stress it is best to decrease the amount of yellow In your living and working spaces. Spiritually speaking yellow represents the element of fire, our sense of vision, authority, energy, harmony and personal identity. 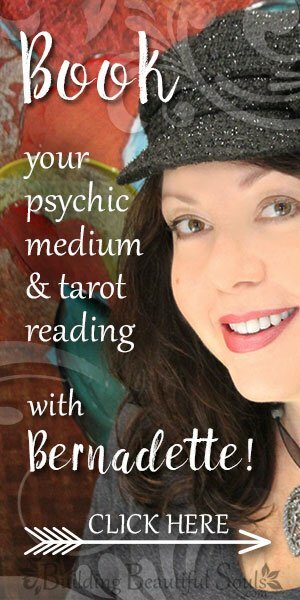 In the Tarot it symbolizes the intellect and spirituality (often working in tandem). Click to read the in-depth article “What Does The Color Green Mean.” or read the short version below. Green has gone from simply being a color to having transformed into a verbal description of the eco-friendly movement. This alteration seems apt since humankind has always associated green with renewal, spring, fertility and good fortune. On the negative energy side there’s the green-eyed monster and being green with envy. Even with the few minor deleterious comparatives, nearly every culture associates green with Mother Nature and all her glory. In the West it is a hue that means “go” thanks to traffic lights, finding a shamrock portends good things and green is said to be a positive color for pregnant women. Light workers tell us that green is a way of bringing our head and heart into balance. It also spurs growth, inspires peace and charity and also revitalizes a weary soul. In today’s society, green is a color vastly needed in many living and working spaces. Green combines the upbeat nature of yellow with the calm clarity of blue. Those attracted to green often find themselves becoming diplomats who seek true equity in a decision. Green people are also very hearth and home oriented and enjoy sharing of what they have with others simply because it’s the right thing to do. Along with yellow, green supports prosperity in business. Too much of it, however, leads to materialistic tendencies. Metaphysically green has affiliations with the Earth and Water elements. In Tarot decks it often reflects a fresh start. Green correlates with the Moon and the planet Venus. This can lead to a lot of emotional swings but when used with restraint helps people open up and become more vulnerable in relationships. Click to read the in-depth article “What Does The Color Blue Mean.” or read the short version below. Blue is decidedly “cool” – in fact it’s regarded as one of the most popular colors. Dark blue symbolizes intellect, self-worth and authority. Brighter blues harmonize with vigor, constancy and freshness. Sky blue is the color of peace, spiritual pursuits and composure. The color Blue sometimes bears association with sadness or melancholy (feeling blue) including in Korea where it is the color of mourning. It also sometimes represents avoidance, intangibility and haughtiness (blue blood). Physically blue helps people trying to curb their appetite. It’s also good for people who want to build loyalty and trust in their relationships. In the work space blue helps you move toward your goals in an orderly, calm manner. 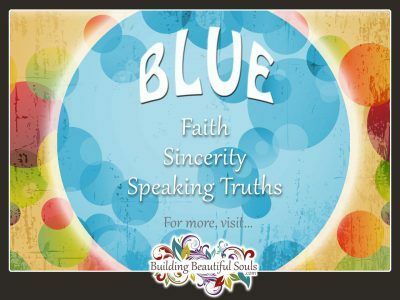 With friends and family blue hues support positive communication where you find your true voice in various matters. Blue is often connected with spiritual studies and meditation. The only caution here is that too much blue holds you to matters of the past rather than embracing the present or future. In Christianity blue is the color for the Virgin Mary. It also represents purity and sincerity akin to white particularly in lighter tones. Egyptians considered blue the color of heaven itself. Psychologically blue tones provide perspective. Light workers use blue to open energy flows in the auric field, particularly to release stress or help a person internalize new ideas and personal transformations. Magickal practitioners use blue or purple to represent the Water Element, the Western quarter of creation, psychic abilities and peaceful joy. In Tarot Decks blue in the art often denotes intuitiveness, feelings and healing. Click to read the in-depth article “What Does The Color Indigo Mean.” or read the short version below. If Indigo could talk it would say, “I see you!” This is the color of perception. In working with the psychic self and the third eye, Indigo is your go-to color. People struggling with meditation (you know, when your toe itches or a mouse a mile away distracts you) will find that this color is a great partner. Since the 1990’s the Metaphysical community has been buzzing about Indigo children. These souls come to the Earth Plane with specific gifts and knowledge intended to help humankind reach the next stage in our evolution and stretch our potential. Even beyond this framework, this particular hue facilitates reaching our Higher Mind and amplifying our senses. From this place of awareness we learn how to serve with dignity and integrity. When you want true objectivity and wisdom turn to people drawn to indigo for insights. You would think that indigo spirits are all fluff and no substance, but nothing could be further from the truth. These people can put nearly anything into a tangible system and order that not only accomplishes current goals but also plans for future needs. Indigo is also highly innovative with a flair for the theatrical. The negative aspects of indigo include developing additions, extremism, bigotry, impracticality, depression, and bias. Thankfully the energetic level of this hue keeps many people from going down the wrong path. Light healers use indigo for problems of the jaw, tongue and mouth. The color resonates with inner struggles and insights that you might not otherwise resolve in your daily world. It is an inventor’s hue that creates the “ah ha” moment. For metaphysical practitioners its considered useful for incantations and spell work. Click to read the in-depth article “What Does The Color Purple Mean.” or read the short version below. At the head of the color class we come to purple, a hue associated with the Crown Chakra through which Spirit communicates. In ancient civilizations the color was reserved for royalty and leaders, in part because the dye was so rare. Even when purple clothing became more familiar it remained a symbol of wealth and affluence. As a result there is also some lingering connotations with pretension and snobbery. New Age tradition associates purple with magic and the great mysteries of all creation. It is a link to our spirituality, resourcefulness, the hidden recesses of the mind and our Sacred Self. In meditation and spell work its useful for improving psychic abilities, astral projection and a greater understanding of God’s will. Purple segregates people opinion wise similarly to orange. Children seem to be more receptive to it as do our Elders. In between those two the consensus remains split. Physically healers use purple for treating nervous disorders and irrational fear (like phobias). Many consider purple a feminine color with just enough masculine traits mixed in for good measure. It’s balanced in the storm of life and helps us deal with angers and passions that might otherwise get away from us. It is the color of the Adept Path, which is not without challenges. Those attracted to purple show their feelings openly. The hue helps them embrace their personal power and use it responsibly. Click to read the in-depth article “What Does The Color White Mean.” or read the short version below. It has often been said that nothing is simply black or white, and it’s a powerful lesson provided by these two contrary colors. 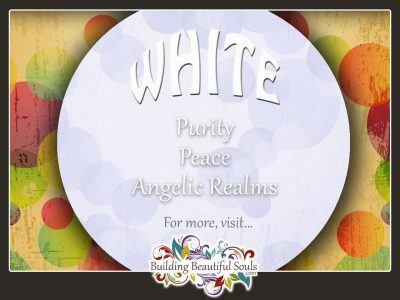 Alchemically speaking white has the highest of all vibrations, thus the reason we talk about “white light” when discussing various powerful spiritual experiences. Even so, this does not make black the, well, proverbial black sheep of the color family. Without black we could not know the beauty of white on a substantive level. Where white symbolizes youthful innocence, purity, humbleness and the Element of Air, Black presents sophistication, an air of mystery, sexuality and the cycle of death and rebirth. As with the concept of Yin and Yang, the duality of dark-light, black and white reflect natural complimentary manifestations. Black absorbs; white reflects. Philosophically one could say that these two colors represent the “as above, so below” but in their dichotomy. White would be the heavens, and black the rich earth from which Nature’s abundance springs. 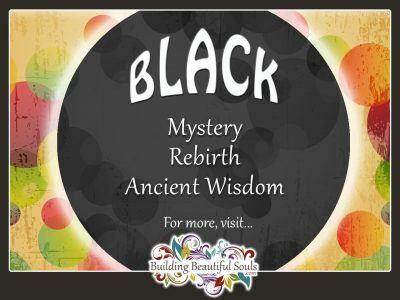 Click to read the in-depth article “What Does The Color Black Mean.” or read the short version below. The color black symbolizes authority, power, and higher learning. It can be an intimidating color – especially since, in almost all cultures, the color black represents death. But, like death, power is an illusion. Seen through different eyes and fresh perspectives, the color black can mean transitions to beautiful new worlds and leadership for the good of all. Plus, surprisingly, the color black is associated with the Yin – the feminine side of all things.